A critical component of any business strategy is communicating with customers. No longer a nice-to-have marketing tool, a website is now a necessity. Hostricity has made it easy to get your business online. 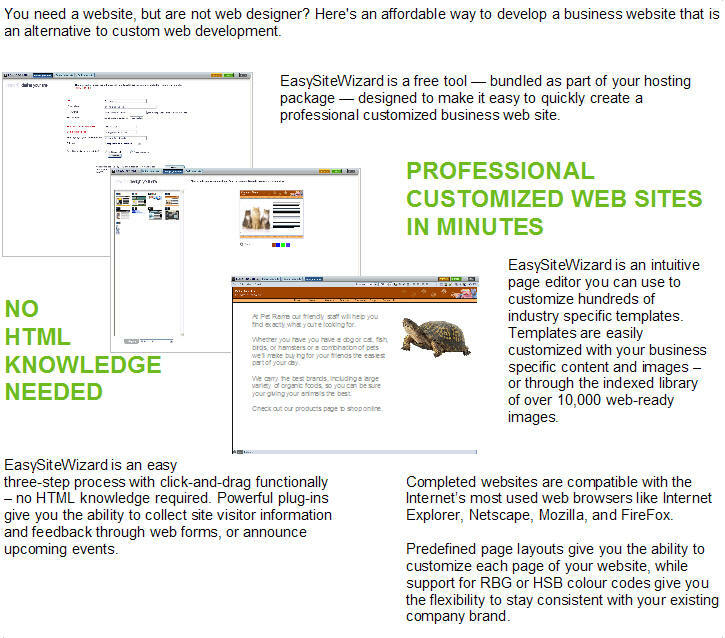 With EasySiiteWizard, you don?t need HTML or programming knowledge. The wizard driven tool can help you get your site up and running in minutes with an easy three-step process. Getting your business online couldn?t be any easier! Incorporate an EasyStoreMaker online store to your website at the click of a button and start selling online. EasySiiteWizard operates on a clustered server environment that is both fully redundant and monitored 24x7x365 ensuring it is always online for visitors to see. EasySiiteWizard follows a simple 1-2-3 process allowing you to create your website in just three easy steps with your corporate colors, customized images, a full-featured online store, and more. EasySiiteWizard is available right in your WebsiteOS under ?Site Builders? ? there?s no software to download, manuals to read, or extra fees to pay. Just click and go!